Tot time was dear to the hearts of every sailor and no less so within the confines of submarines. To the regret of many, the tradition of providing sailors with a daily tot (2.5 oz.) of rum came to an end in of March 1972. Former Chief Engine Room Artificer, Gilles Poirier took great pleasure in drifting back in time to retrieve the memories below. You can almost see the smile on his face. 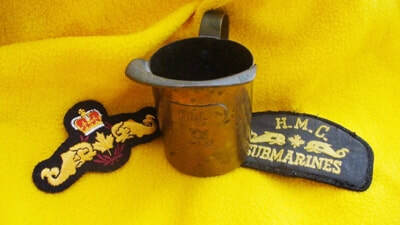 Photo right: The tot measure used the last time rum was issued in the after ends of HMCS Ojibwa on March 31, 1972. Now we are on my favorite subject. Rum used to be taken on board in large boxes of 12 X 48 oz bottles. Since boxes take a lot of room, as soon as it arrived on board, the Cox’n would muster it on the deck just outside the Cox’n store. On the way down to the Cox’n store, next to the ladder, were two very large stainless steel lockers. Inside those lockers was a large rum tank, and next to it a smaller rum tank. They were made out of Monel*. The Cox’n and his staff would then proceed to empty all the rum into those tanks. In my days, the rum (190%) was supplied specially to the Navy by good old Captain Morgan, it was some smooth. Mind you, I have only tasted one bad rum in my life, and it was banana rum. 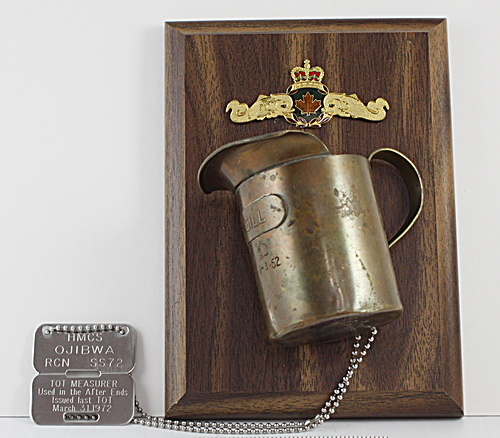 As an aside, when HMCS Onondaga was decommissioned, at the end of its life, the rum tanks were raffled off, and I had won the larger of the two, it sat outside my place, next to the barn for many years. I eventually gave it to a friend of mine who was building a fishing boat, he used it for years. Of course, … here comes another “aside”. Rum used to evaporate, regardless how careful you were. This evaporation was not compensated for in the allocation. Therefore, the Cox’n’s only way to “make up” for this loss and yet still “balance” the book was to choose between the two methods available to him - add water, which would dilute the percentage (octane) of the rum, OR, if over the course of a few days, at tot time, you might notice that the Cox’n, at times had his thumb inside the pouring measure. You knew better than to say anything. That was his way to “make up” for the rum that had evaporated, and still keep his rum’s high octane unchanged. Ah the life of a submariner.